Many patients are ready to undergo a cosmetic smile makeover, but they’re not sure where to start with treatment. If your teeth are in need of a comprehensive transformation, porcelain veneers may be the right option. This high-quality restoration can create stunning improvements in as little as two appointments here at Lakeside Daytona Dentist. Please contact our Daytona Beach, FL location if you’d like to schedule a consultation with Dr. Silva, or if you have any questions. 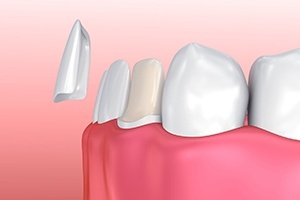 Veneers are customized shells of dental porcelain that are designed to be extremely thin. This is so they can fit comfortably and naturally over just the front surfaces of your teeth, hiding years of cosmetic flaws behind a brand-new appearance. Dr. Silva can even use veneers to change the shape, size, color, or translucency of your smile, if you desire it. Generally, receiving new, custom-made veneers will require two appointments at our practice. During the first visit, Dr. Silva will prepare the requested teeth by removing a small amount of natural enamel and then capture a detailed impression. This impression and our directions will sent to the lab, and you will be provided with a temporary veneer in the interim. Once the permanent version is ready, you will come back for your second appointment so that we make final adjustments and then place the finished veneer.